What better way to show your support for a presidential candidate than to burst out dancing in the middle of a metropolitan city while clad in colorful pantsuits? That's exactly what 170 people decided to do on Sunday, Oct. 2, when a Hillary Clinton pantsuit flash mob suddenly emerged and took off in Union Square. For five minutes, the group of dancers moved to the beat of "Can't Stop the Feeling" by Justin Timberlake — with nearly every one of them wearing a pantsuit as a nod to the style uniform for which the first woman to be nominated for a major political party has become known. What boggles my mind is that this giant flash dance mob started out as simply a light bulb idea just a week earlier. On Sept. 24, co-organizers Celia Rowlson-Hall and Mia Lidofsky reached out to Crishon Landers, a 29-year-old professional dancer based in Washington, D.C., asking if he would help choreograph the flash dance. 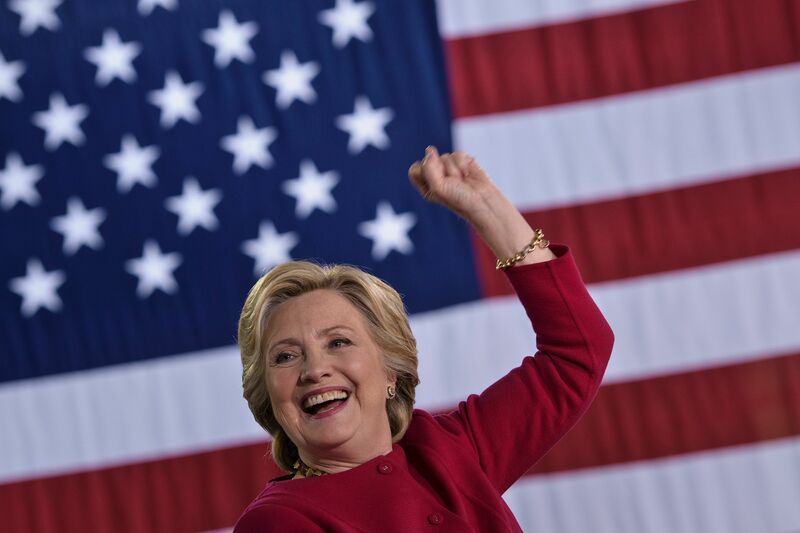 "A lot of the embedded movements speak to some of the things that [Clinton] stands for and the things we believe in," the dancer, who goes professionally by the name Crishon Jerome, notes. For instance, at one point the dancers held three fingers down over their waists, representing reproductive rights. Immediately after, they held their forearms parallel to one another, signifying equal pay between men and women. The universal fist in the air meant Black Lives Matter. Other dance movements made a statement about what the group did not support, such as fracking. It's a well-thought-out number that also incorporates Clinton's little shimmy from the first presidential debate and a version of the grapevine dance (similar to the Electric Slide) to represent Michelle Obama's powerful words from the Democratic National Convention: "When they go low, we go high." And that fist bump against the chest? The organizers call it "heartbeats for Hillary," showing that, heck yes, they're with her. Jerome says this project is an immersion of art and activism, which the organizers internally call artivism. "It's our small way of doing something where we are to show that we're listening and we're here to help," says Jerome. They recruited dancers through social media and word of mouth. At one point, they had up to 250 people interested in participating in the dance. They had rehearsals all day on Friday. On Saturday, they rehearsed at Vineyard Theatre just five minutes away from Union Square. And on Sunday, it was showtime. Don't they all look dapper? In the video, Jerome is wearing a steel blue pantsuit with a white hat and silver shoes. With all hands on deck, including production and dance assistants, the group was able to find pantsuits in every color imaginable from thrift stores all over New York City. The pantsuits provided an inclusive spirit to the dance mob, serving as a symbol of unity and diversity. "The idea of (wearing pantsuits) was almost a no-brainer when it came to trying to represent Hillary and holding true to the fact that people are who they are," Jerome says. "The pantsuit is the thing that connected us and really showed several different demographics united as one." This contrasts with Republican presidential nominee Donald Trump's strategy of "alienating or isolating certain demographics," Jerome continues. "There's a lot of uncertainty when it comes to have a candidate like Trump whose rhetoric is increasingly marginalizing so many. He's marginalizing women, he's marginalizing [LGBTQ people], he's marginalizing immigrants. Our country is a melting pot." Admittedly, I'm not a good dancer by any means, but watching the video makes me want to get up in the office and start grooving. But not only is this dance mob a random performance in the busy streets of New York; it's also sharing the much-needed message that Hillary Clinton is fit to be president and, well, Donald Trump is not. "We wanted to let her know, we got you," Jerome says. This post has been updated to include additional information.